There’s been a lot in the press over the last year or so about the dangers of sugar. In nutritional circles, this is old news, but we have been heartened to see, not only the media but parliament finally catching up on this insidious threat to the nation’s health. Just last week, the headlines reported a 60% rise in the number of readings that diabetes is costing the NHS £1billion per year in prescriptions alone and many diabetics needing long-term medical treatment for complications, the real cost is thought to be £10million. Experts believe that this condition will bankrupt the NHS. 90% of all cases are Type 2 diabetes – a preventable “lifestyle” disease. 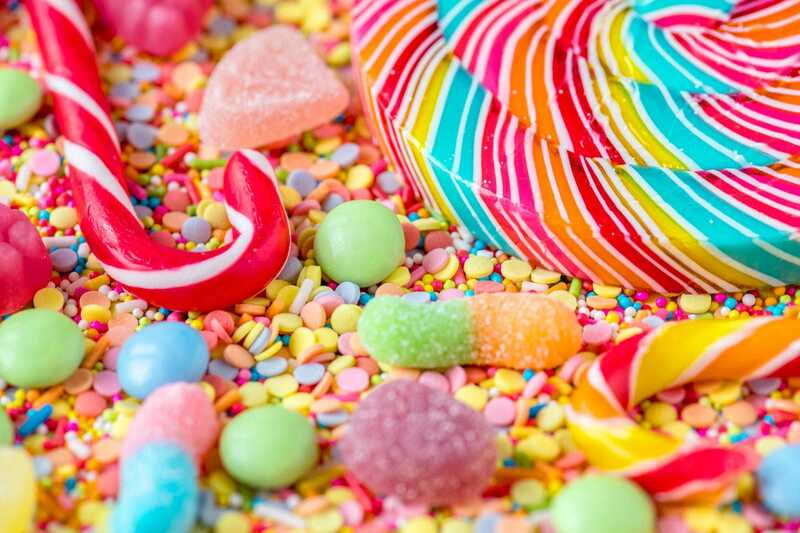 Yet despite all the media attention on sugar, clients attending our Blood Sugar Balance talks at Homefield are always surprised to hear us discuss how much sugar is in, for example, a bowl of muesli, or a fruit yogurt or a cereal bar. A lot of people still do not know how to read the nutrition label on foods, other than to look at calories or fat. 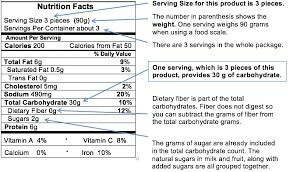 Furthermore, many people do not appreciate that all carbohydrate converts to sugar in the body, so when looking at a label you need to note the total carbohydrate and also the “of which sugars” number or the “added sugar” number. 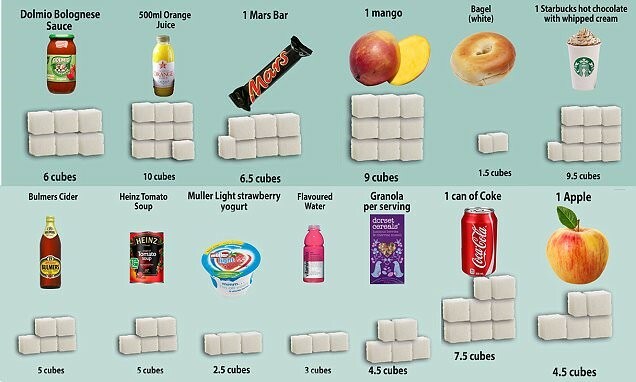 Look at this graphic on how much sugar is in common foods and drinks. Check labels on every packaged or processed food item. Also be aware that all carbohydrates convert to sugar in the body and the rate at which they do that is measured by something called the Glycaemic Index (G.I.). A further measurement is the amount of carbohydrate in a food – the Glycaemic Load (G.L.). We want to avoid high GI/GL foods and eating most of our foods from the low-medium range. A great thing to do is to download a GI/GL app on your phone and check every food. You will soon learn which foods to limit or avoid. 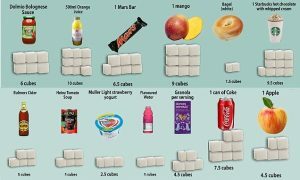 So use this week to become more aware of sugar and where it can be found (almost everywhere!) and resolve to cut down on your sugar intake.